Single-cells are the basic unit of cellular life function and evolution on earth. Accurate and high-throughput sorting of single-cells are key tools for mechanistic dissection of functional heterogeneity among cells and probing yet-to-be-cultured microbes in nature. Due to its label-free and non-invasive features, Raman-activated cell sorting (RACS), which sorts cells based on their Single-cell Raman Spectrum (SCRS), has attracted increasing interest. 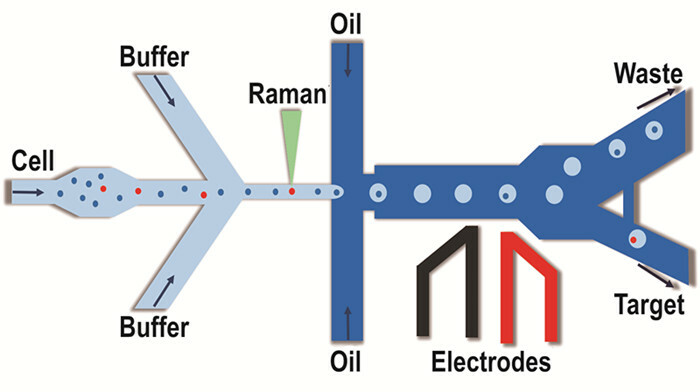 For the key question of increasing the sorting throughput of RACS, the Single-Cell Center at Qingdao Institute of Bioenergy and Bioprocess Technology (QIBEBT), Chinese Academy of Sciences (CAS) developed a novel Raman-activated single-cell Droplet Sorting (RADS) technique, which featured the highest sorting throughput among the existing RACS. This new work was published on Analytical Chemistry. Droplet-based microfluidics coupled with dielectrophoretic (DEP)-based cell sorting can achieve ultra-high throughput, and can be seamlessly coupled to downstream droplet-based DNA/RNA extraction or cell culture. However, droplet-based microfluidic RACS prototypes have not been demonstrated. The research team from Single-Cell Center used the following strategies: (i) cells were interrogated for SCRS prior to droplet generation, which eliminates the interference from droplet surface and oil; (ii) single-cell droplet encapsulation was directly coupled to DEP-based droplet sorting, which simplified the system design and operation; (iii) a homemade software, QSpec, was developed to automatically integrate and synchronize the RADS system. Finally, based on the RADS system, AXT-hyperproducing H. pluvialis cells were sorted with high-throughput (~260 cells min-1) and high-accuracy (~98%), Of the RADS-sorted cells, 92.7% remained alive and able to proliferate, which was equivalent to the unsorted cells. Thus the RADS achieved a much higher throughput than existing RACS systems, preserved the vitality of cells, and facilitates seamless coupling with downstream manipulations such as single-cell sequencing and cultivation. Previously, Single-Cell Center demonstrated that SCRS, via the ramanome approach, can identify and analyze nearly unlimited cellular functions in label-free and non-invasive manner. Hence, by coupling with the ramanome approach, RADS may become a generally applicable, versatile and high-throughput RACS platform for label-free functional screening of cells and subsequent omics profiling at single-cell resolution. This work was guided by Prof. HU Qiang from Institute of Hydrobiology, CAS and Prof. WANG Wei from Peking University, and financially supported by National Natural Science Foundation of China (NSFC), CAS and China Postdoctoral Science Foundation Grant.